PCalc 1.2 released; will jaded media notice? PCalc RPN Calculator has already undergone a name change to boost the scientific calculator’s visibility on the App Store. Now developer TLA Systems is taking the next step to promote an app that’s already won raves for surpassing the functionality of the iPhone’s built-in calculator: it’s offering a free, lite version of PCalc. 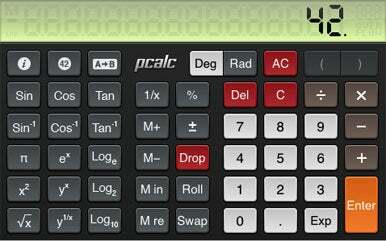 PCalc Lite Calculator is billed as a fully functioning version of TLA’s PCalc RPN Calculator. The idea behind the free release, TLA says, is to give App shoppers a taste of what’s in store for them if they pay $10 for the full-featured version of PCalc. The full version offers more settings and themes, a paper tape, engineering, and full support for hexadecimal, octal, and binary calculations. TLA only plans to offer PCalc Lite for a limited time. Take A Note , from Readdle: The $5 note-taking app offers the ability to categories, search, and share notes as e-mail attachments; it also promises the ability to transfer notes to a Mac or PC. Wide Email , from LizzardWerks: While not a debut—this $2 wide-format e-mail app has been available for several months—the newly released 2.0 update improves the typing shortcuts feature to allow users to insert frequently used phrases or boilerplate paragraphs by taping a few keys. iHeart , from Anatoly Butko: The $10 iPhone-only application measures your pulse after any physical activity. Mint.com , from Mint.com: The free finance app lets you budget and manage your money with the support of a companion Web-based app at Mint.com. iSushi , from Thinkmobi: The free app lets you find nearby sushi restaurants via the location features in the iPhone and iPod touch.